State BJP got short in the arm on Thursday when Aga Sayeed Mohsin, a senior leader of Congress and District Vice-President from Budgam, resigned from Congress and embraced BJP. 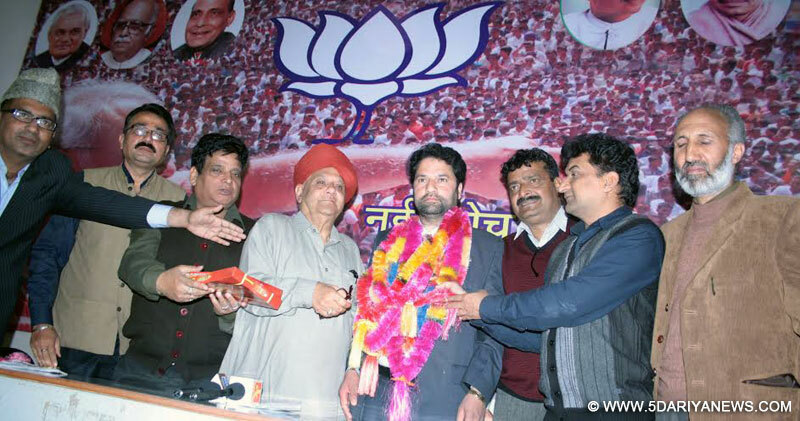 He was welcomed into the party fold by BJP National Executive Member & Leader of Legislative Party Ashok Khajuria, MLA, in presence of senior leaders Chander Mohan Sharma, Mohan Singh Chauhan, Sofi Yousuf, Dr. Ali Mohd. Mir and Er. Ghulam Ali Khatana, who garlanded him and offered sweets. Welcoming Aga Sayeed Mohsin into party fold, Ashok Khajuria said that a wave in favour of BJP is sweeping the minds of people across the country irrespective of their religion, region and caste. The people have realized that the Congress always misled them on communal slogans for vote bank politics. Its policy of pide and rule has been exposed and the people have made up their mind to teach it lesson in the forthcoming election. It is apparent that people from all sections of society are unanimous to support BJP as they are of the firm belief that only BJP can provide good governance, check corruption and price rise and ensure nation’s honour at International level. Aga Sayeed Mohsin, on this occasion, said that the Kashmir valley has not remained untouched by the massive wave of BJP and its Prime Ministerial candidate Narendra Modi. “Today a common Kashmiri is of the view that the BJP is the only political party which made sincere efforts to bring normalcy and peace in the state and it was proved during BJP-led NDA rule at the Centre ”, and added that initiating LoC trade, bus service between India and Pakistan from Kashmir, sincere efforts to reunite families through people to people contact and many other such steps had improved the life of the common people but these got shelved after Congress took over in 2004. He said that the Congress, which is in power at the Centre and coalition partner in J&K, only promoted dynastic rule, corruption, nepotism, price-rise, lawlessness, induced sense of insecurity among citizens and flared communalism.BJP State Vice-Presidents Usha Choudhary and Sakina Bano, State Spokespersons Dr. Nirmal Kamal and Lalit Moza (Adv. ), State Press Secretary Balbir Ram Rattan, Migrant Cell Co-Convenor Shilpi Verma and others were also present on the occasion.